There are only three routes and the best one to take for a terrific view of the bay and Alcatraz is the Powell-Hyde route. This goes from Powell Street in the shopping centre of San Francisco down to Ghirardelli Square. You need to buy a ticket from the turnaround spots or from the conductor. The cable cars are always busy and it can be quite daunting to try to get on them. Our advice would be not to get on at the main turnaround stops as there are often long queues. Instead, walk up the route for a while and try and get on a few stops up. Yes the cars will be busy when they come, but we found the conductor has usually saved a bit of space and the further up the route you go, people do get off too. This is an extract from our free San Francisco City Guide. 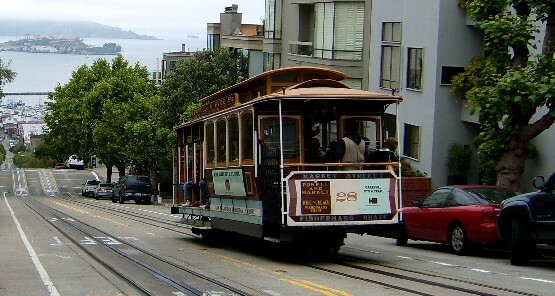 The other cable car routes are Powell-Mason (running up Powell Street and then down Mason Street to Fisherman’s Wharf) and California (running from the financial district, through Chinatown, to Van Ness Ave). A single journey is not cheap at $6, but the adult day pass is better value at $14 (2012 prices). 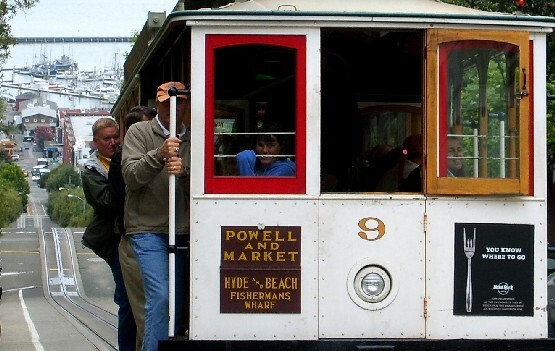 Once you’ve ridden a cable car, we’d recommend that you visit the cable car museum. You’ll find this on the Powell-Hyde route and if you are interested to know how the cable cars actually work, it’s fascinating. There is all the history you’d expect in a museum, but you can also see the huge wheels which move the cables and make the whole thing function. It’s on Mason Street at the junction with Washington and the museum is free. Open daily from 10am to 6pm in the summer months and from 10am to 5pm in the winter months.